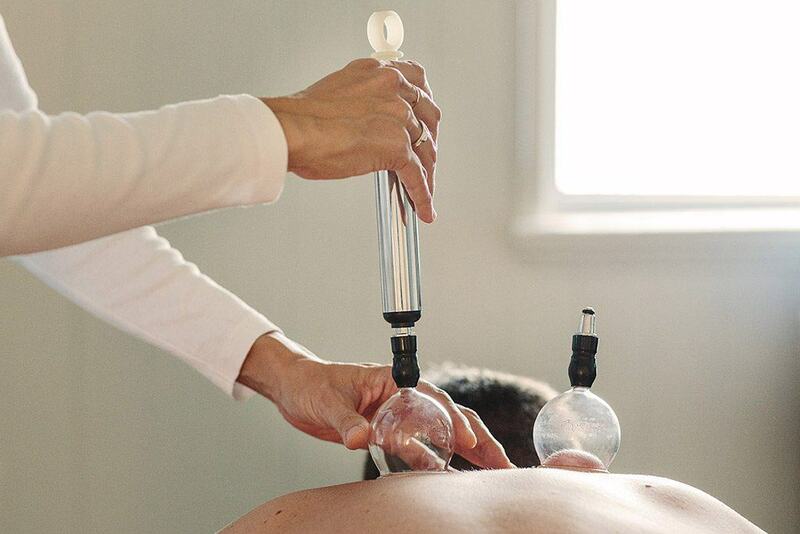 Cupping belongs to traditional Chinese medicine therapy dating back at least 2000 years. It was also applied as a therapeutic method independently by the ancient Egyptians and Greeks. Cupping is generally performed to dispel stagnation (stagnant blood and lymph), thereby improving Qi and blood flow to facilitate healing. The actual cup can be made of materials such as bamboo, glass, plastic or earthenware and is placed on the skin. Through suction, the skin is gently drawn upwards by creating a vacuum in the cup over the target area of the skin surface. This suction is created using either fire cups or mechanical devices like vacuum pumps. The cups stay in place for five to fifteen minutes during treatment. Due to the negative pressure provided by the suction muscles can be loosened and blood circulation is encouraged. Cupping may assist in easing muscle knots, swelling and pain. Practitioners often apply it in combination with acupuncture for back, neck and shoulder pains and stiff and tight muscles in general. Traditionally, it was also used to treat respiratory diseases such as the common cold, pneumonia and bronchitis. By dispelling stagnant blood and lymph and thereby improving Qi flow, cupping enhances and promotes healing. To achieve optimal health, we need to provide good blood circulation. When this is not the case, we may suffer from various chronic health conditions that are difficult to treat. Depending on the specific application of the cups, skin markings are common after cupping. They may show up as reddish rings that disappear quickly, or darker discolourations that resemble bruises. They can appear when stagnant blood is lifted from congested capillary beds, allowing new blood to enter to nourish the local tissues and will vanish after a few days.